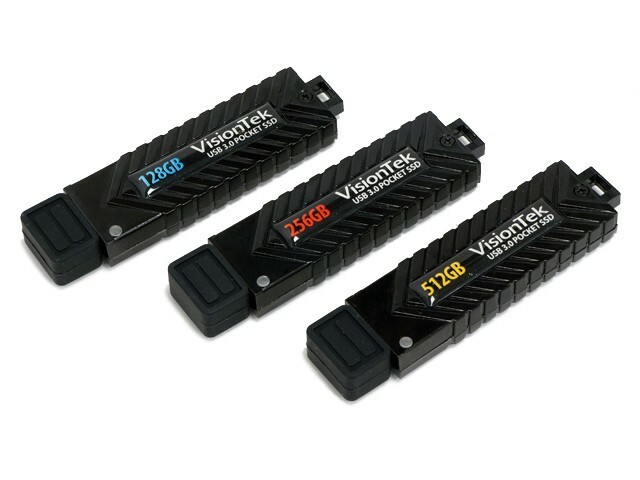 VisionTek Products LLC, (VisionTek), a leading manufacturer of award-winning, high-performance upgrades and accessories for PCs and Macs, today announced an expansion to the VisionTek USB 3.0 Pocket SSD line of thumb drive-sized Solid State Drives. The Pocket SSD line is ideal for creative professionals, IT power users, and performance enthusiasts seeking ultra-fast media and large file transfers. Available in full density storage capacities of 128 gigabyte (GB) with an SRP of $89.99, 256 GB with an SRP of $149.99, and 512 GB with an SRP of $279.99, the 3.0 Pocket Drive will launch in North America later this month. The next generation of VisionTek USB 3.0 Pocket SSDs combines a sleek portable design and ultra-fast read/write demands, all without compromising large capacity requirements. The VisionTek USB 3.0 Pocket SSD can be plugged into any computer’s USB 3.0 port to save or share work files, movies, images, music libraries, and more. The speed, reliability, and storage capacity of the VisionTek USB 3.0 Pocket SSD rivals internal SSDs, exceeds standard USB flash drive speeds, and demolishes the read/write speeds of external hard disk drives. They can be used with nearly any Windows, Mac OS X, and Linux based system with a USB 3.0/2.0 interface. The VisionTek USB 3.0 Pocket SSD is similar in size to a standard USB thumb drive, but that’s where all similarities end. The aircraft-grade aluminum housing contains a fully functional Solid State Drive with a multi-chip design utilizing high endurance MLC NAND that delivers consistent 450MB/s reads and 155MB/s writes, which makes it possible for file transfers to and from the VisionTek USB 3.0 Pocket SSD to be done 20 times faster than standard USB 2.0 flash drives or external hard disk drives. All three models of the full-capacity VisionTek USB 3.0 Pocket SSD are designed in the US and built with the same award-winning technology as VisionTek’s other internal SSDs. The technology’s design architecture employs a USB to SATA bridge, connected to an SSD controller for the highest speed, durability, and reliability. Data refresh technology ensures data integrity and the redundant storage elements produce some of the longest life expectations in its class.